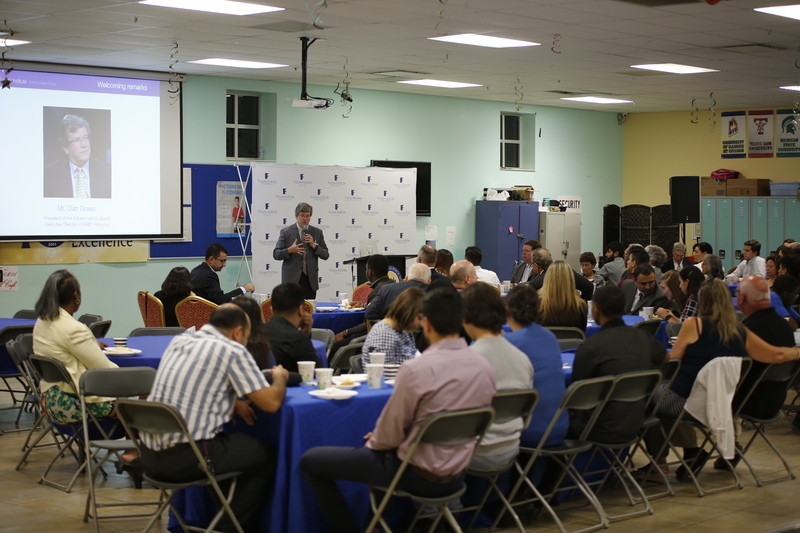 Future Institute, sponsored by Concept Schools, hosted the State of FIRM (Future Institute Road-to-Success Mentorship) Dinner on September 20th, 2018 at Chicago Math and Science Academy. This event’s main purpose was to bring community members, students, FIRM mentees and mentors together to share perspectives and give the 2018-2019 program a strong start. With the assistance of two Board members, Paul Levine and Edgardo Vargas, FIRM mentees and mentors were recognized for their commitment to the program and invited to speak about their experiences and aspirations. Brian Herrera, a CMSA graduate now with a bachelor degree from National Louis University, said that his mentorship with G.A. Finch, a financial advisor at Hoogendoorn & Talbot LLP, gave him the connections and the inspiration to pursue a law degree at Loyola University. Dr. Rae Bouvin, doctor and owner of Pro-Holistic Care, talked about her mentorship with Musharrat Islam, who is studying healthcare at Loyola University. Dr. Bouvin’s personal experience as a first generation college student motivated her to join the program and provide support and experience for someone else. The program concluded with Board member Charles Franklin saying, “It may be rewarding for a mentee to have someone that they can lean on, but believe me, it’s just as rewarding for the mentors. You learn as much from your mentees, frankly, as you do from the mentors.” Then, the guests were invited to stay to talk and connect about what they learned during the program. Future Institute hopes to have a successful year with the FIRM program and form lasting bonds between mentors and mentees.